Soon, you’ll also be able to hear the rainbow. We’re partnering with the folks behind A Tiny Bit Huge to produce a Pride playlist of local LGBTQA+-supportive artists. Just like A Tiny Bit Indie and A Tiny Bit Jazz, these playlists will go on sale at atinybithuge.com. Like all money raised for Pride, the proceeds will go to support Seacoast Outright. The next phase in our Paint the Town Rainbow plan are the Portsmouth Pride rainbow flags. Any business who supports Seacoast Outright with a Pride Pack at the “Loud and Proud” level will get, in addition to T-shirts for their employees, a decal for their window and a playlist mentioned above and other benefits, they’ll also get a big rainbow flag with the Portsmouth Pride logo on it! We can’t wait for our LGBTQA+ youth to see this amazing visual display of our welcoming community. What else can we do to paint the town rainbow? We’ll be chalking the streets with rainbow-colored chalk on our march route. And, of course, we will be the rainbow as marchers clad in red, orange, yellow, green, blue and purple shirts march down the route from the library to Strawbery Banke. But the magic will come from all of you — creativity from our local businesses and residents who take up this mantle of painting the town rainbow for Pride in June by painting their part of town rainbow in myriad creative ways. Help us paint the town rainbow! If you’re a local business, support Seacoast Outright by buying a Pride Pack, a kit tailor-made for your business to show its Pride! Create your own rainbow, in whatever way you create best. La Maison Navarre is making rainbow packages of macaroons, for example. Will you make a rainbow display in your window? Buy a 2017 Portsmouth Pride T-shirt and be a part of our rainbow! Buying a T-shirt is the single greatest way an individual can support Portsmouth Pride and Seacoast Outright this year. 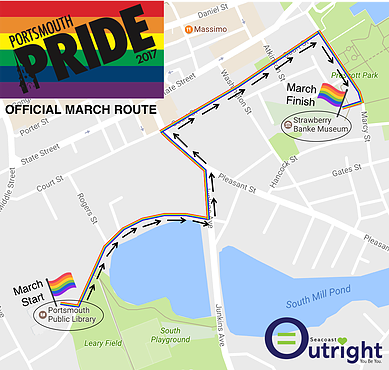 Head to www.seacoastoutright.org/portsmouth-pride-2017 to see all the ways you can participate in our vision to paint the town rainbow. And of course, we can’t wait to see how you all create your own rainbows. See you at Pride!